Only those who are committed to rejecting truth deny the successful response of Venezuelan citizens to the proposal made by President Nicolás Maduro (which is based on the 1999 Bolivarian Constitution) to elect a National Constituent Assembly. They stubbornly deny that, majoritarily, the country backed his project in unquestionable elections held on July 30 and that the opposition made a political mistake by choosing not to participate. If—as happened afterwards—most of the MUD’s parties decided to participate in the electoral process to choose state governors, wouldn’t it have been more beneficial and coherent for the country and for the opposition to also participate in the process of electing the members of the National Constituent Assembly? Wouldn’t the MUD have been able to solve the problems it now faces, and be in better conditions to act in the current scenario? I don’t intend to give lessons in politics to experienced people, but just reflect on this fact to make things clear. Acting legally requires coherence. It’s not advisable to act with ambiguity, eluding truth and seeking ways to deceive the adversary. I write this with emphasis, and it’s related to the current situation where the attitude of opposition leaders keeps their followers in tenterhooks. How can we explain this people that what they didn’t do in better circumstances than now (participate in the constituent election) is now done in a more difficult context? But there is, in the way, another element of doubt that affects the credibility of the opposition. Both in the blatant declarations of some of their spokesmen as in their recent and past activity. I’m talking about the warning that those spokesmen slip, constantly, about a potential combination of “peaceful”,“democratic” ways with violent ones. In other words, they threaten to continue to act like they have done so far, for over 100 days, under the pretext of exercising their “right to protest peacefully”, on one hand, and the use of the most abhorrent forms of terrorism on the other. The opposition constantly exhorts their followers to not let the streets “go cold”. They want permanent protests. But the country is already fully conscious (due to the experience of the latest terrorist activity) of what that means. That’s why the people actively participated in the July 30 elections—over eight million rejected violence and voted for peace. It would be against the will of the people to accept the thesis of the “double way”: acting in the realm of democracy and simultaneously using violence. In the legal, political and institutional framework that was just created in Venezuela after this categorical national pronouncement in favor of peace and against violence, dualism is inadmissible. A choice has to be made between acting in the realm of violence or in the realm of peace. No-one can have both things. Whoever intends to break this basic principle of democracy, which is the rule of law, will be sanctioned according to the Constitution and the laws of the Republic, and whoever respects the juridical organization of the nation will enjoy every single one of the guarantees it provides. Venezuelans are beginning to enjoy the new climate that has been created after the people expressed themselves through the polls in July. These are the renovating effects of the Constituent process. Clumsiness has been installed in the White House. President Donald Trump increasingly resembles a bull in a china shop. In the short time he has been in charge he has opened dangerous fronts in foreign policy, internal policy, finance and economy. He shows himself to the world as a thug. He easily falls for the routine provocations of the North Korean leader, who always manages to exasperate him. He toughens relations with Russia and China, and then backpedals with a levity that is improper for a president of the largest power in the world. Trump’s banalization of power is shocking. 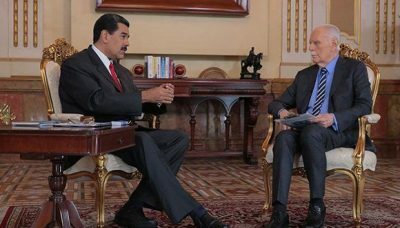 Regarding Venezuela, his attitude has made Maduro a favor. With his threats of invasion, he has managed to change the stance—at least the public one—of the neoliberal leaders of the region: Colombia, Chile, Argentina, Brazil, Peru and Mexico. They went from a position of encouragement of interference in Venezuela’s internal affairs, and even military intervention, to condemning any such attempts after Trump spoke. The US president also left Venezuela’s internal opposition out on a limb: they had to come up with an absurd statement in which they reject a military intervention that they had previously demanded through a convoluted and ambiguous argument, which is revealing of the economic nature of that relation. But we mustn’t underestimate this man. He is too powerful and represents an alliance of the darkest interests in the US. He’s the man of the most aggressive and voracious financial sector, a leader of the hawks of the Armed Forces and the intelligence and “security” organisms. The same ease with which he builds a clothing business for him or his daughter anywhere in the world, he can use to invade nations or use immoral commercial practices to his own interest. The destiny of the world in the hands of this son of the Empire is uncertain and unpredictable. Venezuela is a target. We mustn’t forget that. Buet we must accept this challenge with intelligence, with creative audacity and with courage. As we Venezuelans have always been able to do when we face a challenge. In the early hours of Sunday 13 this month, a group of mercenaries, paramilitaries, and retired and active officials of the Bolivarian Armed Forces of Venezuela, broke into this military unit and managed to get hold of about a hundred rifles and other weapons. Of course, those who planned and executed this operation underestimated the troops’ ability to respond. That reaction, which frustrated other dark purposes of the plan, confirms that putschism has no future, and that those who act in those lines should reflect on its consequences. The military institution has an answer, and everything indicates their willingness to repel any aggression and to sanction the wrongdoers with all the force of military justice. The High Command is aware of its responsibility, and also united in their respect for the law and in their defense of national sovereignty. Until now, after this terrorist attack, some local political leaders have been proven to be involved, but the research also reveals names of renowned political figures.